When you run a job, Veeam Backup & Replication checks disk space on the target backup repository and production storage. If the disk space is below a specific value, Veeam Backup & Replication will display a warning message in the job session details. In the Backup storage and Production datastores sections, select the Warn me when free disk space is below <N> % options and specify a desired disk space threshold. In the Production datastores section, select the Skip VMs when free disk is below <N> % option and specify a desired disk space threshold. When the threshold is reached, Veeam Backup & Replication will terminate backup and replication jobs working with production volumes before volume snapshots/VM checkpoints are taken. Such behaviour helps ensure that production volumes do not run out of space. Veeam Backup & Replication also terminates jobs if the amount of free space on the volume is below 2 GB. You can change this threshold limit using registry keys. For more information, contact Veeam Support. By default, Veeam Backup & Replication informs email recipients specified in global notification settings about the support expiration date in every email notification. Veeam Backup & Replication starts sending such notifications 14 days before the expiration date. Expiration information is also shown on the splash screen and on the License Information window (to display the License Information window, select Help > License from the main menu). Clear the Enable notifications about support contract expiration check box. You can configure Veeam Backup & Replication to automatically check for new product versions and patches available on the Veeam website and released hypervisor updates. For more information, see Update Notification. 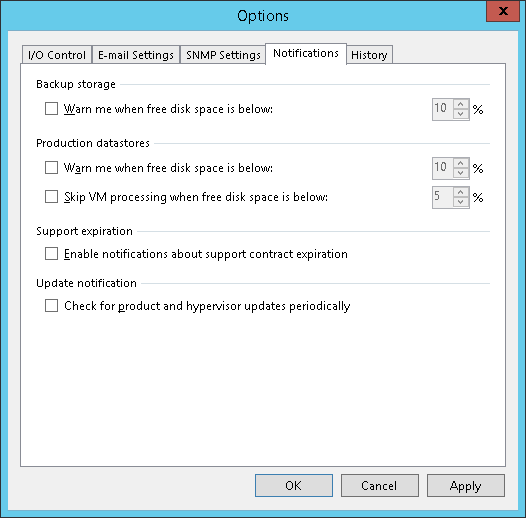 Select the Check for product and hypervisor updates periodically check box. Make sure that the backup server is connected to the Internet. In the opposite case, you will not be able to receive notifications about updates and patches.